Whether made by Motorola, Kenwood or another company, two-way radios used by emergency management teams and firefighters are one of the most important pieces of equipment carried by personnel. The average two-way radio can cost over $2,000 to purchase and more than $130/hour to repair. These radios are designed to function in life-threatening situations that include fire, flood and other natural disasters, but like any man-made item, they are subject to the elements they are exposed to. Radio cases were created for both portability and protection of this vital, life-saving equipment. Unlike standard cell phones which can often be used with any type of covering, the correct function of two-way radios often requires access to a keypad, screen and buttons by those wearing uniforms, equipment and in situations that may give limited mobility at times. At RadioTech™ we design our cases with each radio brand and model in mind. We provide access and limitation to those key areas of the equipment that keep it most functional and safest from harm. And while some companies may tell you it’s fine to encase your equipment in nylon, plastic or canvas, our field tests show that only the finest full-grain leather offers your equipment the best protection and durability, so that is what we use. Your radio case should be designed to keep your equipment safe from harm but easy to use. When you buy a RadioTech case, you can be assured of only the best quality case available to help keep you and your equipment safe. Whether you use Motorola, Kenwood, ICOM or any other major brand of two-way radio, you can find a custom radio case created for your radio brand and model in our online store. 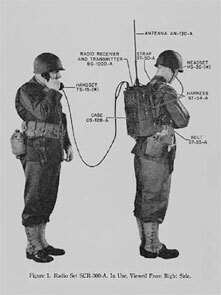 Two-way radio cases date back to the second World War, when the ‘portable’ radios required one soldier to carry the considerably heavy unit on his back while his superior stood behind him to communicate through a handset. Cases were required to facilitate the movement of the equipment for infantry divisions, as well as encase and protect this vital piece of communications equipment from weather and elements. 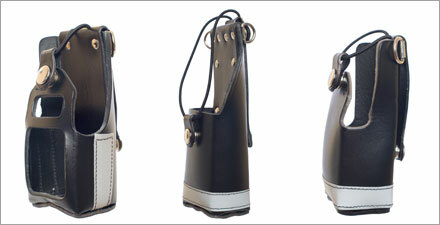 The Motorola XTS 3000/5000 Plain RadioTech Radio Case is made of the finest full grain leather available in the USA. Specially developed to repel moisture and resist scuffing, the hardy zig zag nylon stitching, rust resistant rivets and “D” rings give this case unmistakable quality. When the Motorola XTS 3000R Model II/5000R Model II radio is placed inside the custom made RadioTech Heavy Duty Leather Case, the programmable side buttons are exposed, as well as the PTT button. The front display, in addition to the three menu buttons and navigational keys, are also fully accessible.